A very cute way to produce a signed, selected card! 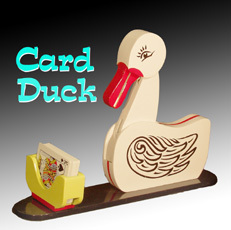 Have someone freely select a card & sign it, you bury it in the deck You place the deck in the holder in front of your duck.Your pet Duck will find the card! Blindfold him so he can't peek at the cards! Finally the Educated Duck dips his beak down, pulling out their selected & signed card! APPLAUSE! !